Tectonica Australia Pty Ltd has been selected by Jankel to manufacture its world-leading blast mitigation seats for the Supacat Special Operations Vehicles – Commando (SOV-Cdo). The seats will be installed in the 89 vehicles being acquired under JP2097 Ph 1B (Project REDFIN) by the Australian Defence Force (ADF) for the Australian Special Forces. Prime contractor for Project REDFIN, Supacat, chose Jankel’s BLASTech seats to provide critical blast resistance to crews mounted in the SOV-Cdo. 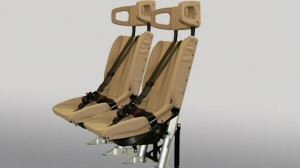 The seats, designed by Jankel, have Energy Attenuation Seat Technology stringently tested in both the UK and US providing vital crew survivability. The selection of Tectonica by Jankel strengthens the project team’s commitment to source locally. The seats will be manufactured at Tectonica’s West Melbourne facility. Following the successful delivery of seats under JP2097, Tectonica will offer local seat manufacture into Jankel’s global supply chain, ensuring a sustainable local manufacturing capability is maintained. Mike Mullen, Jankel Managing Director said, “Jankel has been a strategic supplier to the Commonwealth for several years and is delighted to be now supporting the ADF and Supacat through local manufacturing. Tectonica is a proven supplier of military equipment to Defence and we are pleased to be working with them to establish a local capability which we believe will develop into a long term relationship, enabling Jankel to offer an enhanced service on this and future projects in the region”.